Kairos. He's a beast and he can control time. And feel free to suggest a dragon for a forum member. But again, tell us why. and IF you WERE to Become a Dragon, which would you choose? I would choose Seasonal, I like how it changes with the Seasons, goes with the flow AND quite the variety in Dragon wardrobe! I would stick with my Seasonal, a beautiful dragon! Hoping to get one soon, wish me luck! For me, it'd have to be Bloom. Before Bloom's appearance, I was playing the game in a haphazard way because my son was insistent I play. I really had no clue what I was doing. Around the time of Bloom's appearance, I found this website and as they say, the rest is history. Bloom was also my first dragon to proudly sport a gold crown. Now, my son has long quit the game and I'm still going strong. I think this wonderful community definitely plays a role in that. I don't get to post nearly as often as I'd like but I manage to find the time to check in a couple times a day to see what's going on and if possible, throw a jibe or two LC's way. Either baby opal, my birthstone and the dragon that got me to join this forum, or baby Sakura, because she is the most like a skinny teenage girl. "If you believe in forever, then life is just a one-night stand." 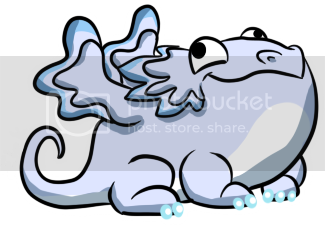 I would be a Bloom Dragon-lovely and graceful in the Spring. Plant. Simple and sweet, a little bit shy, and hides well in the forest. Also, the first dragon I got to know, after Puff of course. I think I would be... the majestic blizzard dragon. Because of my noble posture, and peircing gaze. As said above ( in the other thread ) I ' d like to be a baby summer seasonal dragon. Just because they are soooo sweet. And green is my favourite colour. It has to be a dragon that's able to fly - 'cause that has always been a dream of mine. I always took you for more of a cactus... More seriously, because of his raucousness and obvious mischief. And I thought it didn't hurt that he's the type I wouldn't hug, having a charisma of about 3. If there was a DV Robot dragon, it would be my first choice, but since there isn't one, I have a few other choices on my mind. I think I would like to be the Sakura dragon, because of its subtle and graceful appearance and for my love of the Asian culture. Or would I rather be a fast n' furious Blazing or Sonic, surpassing Mach 1 whenever I pleased? Which just leads to the other options of the sleek Copper or crafty-looking Magnetic. Oh, I really can't make up my mind. I would be a Paper dragon. Beautifull looking like a "real ancient dragon", a bit fearsome but actually quite vulnerable. Kairos without a doubt. Kairos combines beauty, elegance, strength and control of time. Lots of runners up. Sakura, winter seasonal, bloom and paper. I would be an Equinox. Lots of energy, playful yet graceful. They always seem to be having a good time, not a care in the world. River. I'd love to be cute and lazy at the same time. Becoming a great dancer would be icing on the cake. Not sure, honestly! I love the Water dragon's mischievous grin, Sapphire's sweet cat-like behavior, or Ash's resemblance (to me, at least) to a chicken. Or Cactus, who just looks so dang happy all the time. And then there's Equinox, who likes to bust out some sweet, sweet moves. I like to do the same, although if I'm being honest, the Equinox has a lot better moves than me.